Try now: our new creation of the year – especially creamy stirred cream cheese, combined with crunchy pieces of cucumber and carefully selected spices. 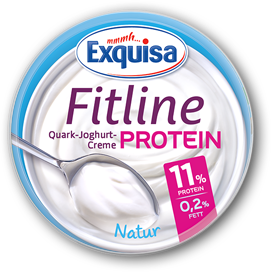 The ideal combination of little fat, a high share of protein and incomparable creaminess! Wonderfully fruity, high in protein and incomparably creamy. Creamy fromage frais with the taste of vanilla. High in protein. 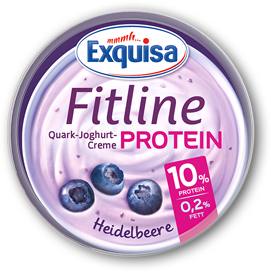 Exquisa Fitline Proteine Blueberry The ideal combination of little fat, a high share of protein and incomparable creaminess! 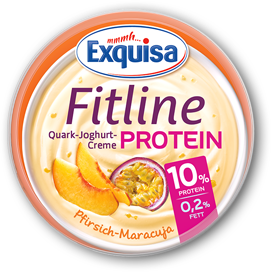 Exquisa Fitline Protein Peach-Passion fruit Wonderfully fruity, high in protein and incomparably creamy. Discover the wonderfully fruity combination of creamy Fromage Frais and juicy orange. 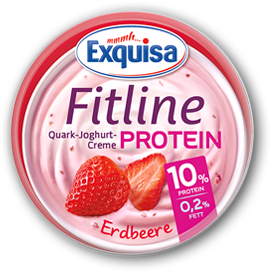 Fruity-fresh delight guarantees our Exquisa Fromage Frais blackberry.